Three from a Kalamazoo College contingent of 15 who attended were recently honored with awards at the 51st annual Kennedy Center American College Theatre Festival regional event in Madison, Wisconsin. 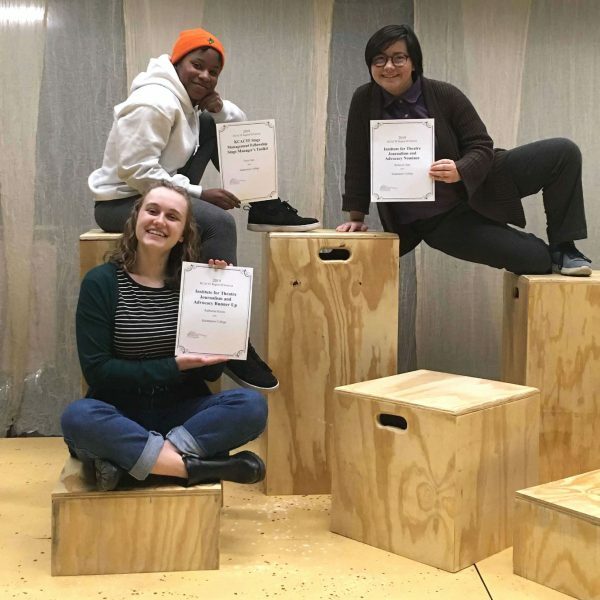 Kate Kreiss (clockwise from lower left), Teyia Artis and Rebecca Chan were Kalamazoo College representatives recently honored with awards at the American College Theatre Festival in Madison, Wisconsin. Teyia Artis ’21, who competed in the Stage Management Fellowship category. The ITJA events allowed Kreiss and Chan to participate in a series of seminars focusing on theater criticism and how it’s changing with technology. Both wrote deadline-oriented critiques and responses about shows they watched each night, targeting a general audience of event attendees with their work. Kreiss earned runner-up honors from event faculty. “It was a hugely beneficial experience that truly married journalism with activism and encouraged us to use our critiques to advocate for what we as writers and artists felt needed to be put on stage,” Kreiss said, adding she advocates for thoughtfully-done stories that reflect modern life. Fifteen students represented Kalamazoo College at the American College Theatre Festival in Madison, Wisconsin. “As a senior, receiving an honorable mention from ITJA and participating in the course has shown me a way to marry my theatre arts and English majors, and has offered me with a career path that I hadn’t considered,” Kreiss said. Chan was given top honors as the ITJA nominee from Region III. In other words, she is eligible to become one of four students selected for the national American College Theatre Festival this year in Washington, D.C.
Artis was initially awarded a certificate of merit from the American College Theatre Festival for her work with “It Can’t Happen Here,” the Festival Playhouse production in fall 2018. 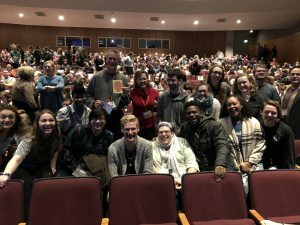 That honor allowed Artis to submit a prompt book from the show to the Region III event in Madison, where student stage managers received feedback from professionals. Her honor from those professionals provides her with a Stage Management Fellowship certificate and a book consisting of tools for stage-management success. Improve the quality of college and university theater in the U.S. Learn more about the Region III Festival at its website. 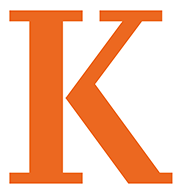 Learn more about Theatre Arts at Kalamazoo College at our website. This entry was posted in Fine and Performing Arts, News Stories and tagged faculty, students, theatre, . Bookmark the permalink.